Individuality is something to be prized and cherished. 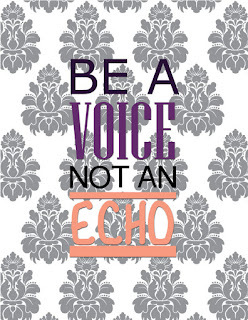 We often find our voice through our creative outlets...our own sense of identity. Yet there are moments when we feel the pressures of society or the demands that we 'follow the herd'. Sometimes, we just need a little reminder that being unique is something to be celebrated. Today we bring you a free printable to remind you of just that! Print it out using the link below and spend some therapeutic time coloring it to fit any color theme in your home or office. Frame it, and be reminded that it is a good thing to sometimes go against the grain.